Iron Pillar of Delhi which is 23 feet column, is well renowned for its rust-resistant metal composition. Iron Pillar of Delhi is a standing example for workmanship of Blacksmiths of ancient India. 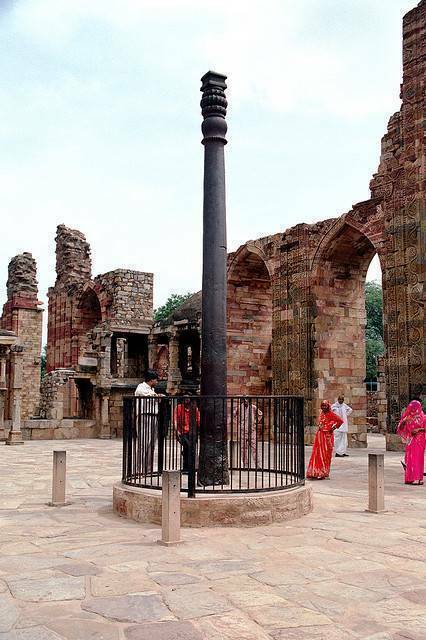 Located within the premises of Quwwat-ul-Islam Mosque inside the Qutub complex, the Iron Pillar weighs six tons. The pillar has been an object for interest for archaeologists and metallurgists because of testimony of the craftsmanship of ancient Indian blacksmiths and pillar's high resistance to corrosion. There are many versions of discussions making rounds regarding the origin place of this Iron Pillar. Few say it was built and installed in the current site itself. Whereas the studies of metallurgy and iconography of pillar reveals that it might be bought from Vidisha of Madhya Pradesh by Iltumish, King of Delhi, when he invaded Vidisha in 13th century.